Pirelli is Italy's premium tyre maker and is the world's 5th largest tyre manufacturer with 22 global manufacturing sites and branches located across 160 countries. Their reputation for high performance, innovative, quality and high-end products have made them one of the world leaders in tyres. Since 1907, Pirelli Tyres have sponsored sporting competitions and are the single supplier of tyres to the FIA Formula One World Championship and World Superbike Championships. Their patented wider tyres are still the industry standard for sport and racing cars across Europe and have been for nearly 40 years. Pirelli P Zero - suitable for high performance, sports vehicles that demand precision on cornering, traction on wet and dry ground at high speeds and shorter braking distances. This range manufactured with nano-composite compound P ZERO™ ensures maximum grip and stability, improved control and safety, as well as reduced cabin noise levels. Pirelli Cinturato P7 - designed for medium to high-powered cars, this long lasting tyre is constructed using an even-wearing, advanced hybrid material and offers reduced fuel consumption and CO2 emissions, as well as a relaxed, comfortable and safe driving experience. Pirelli P Zero Rosso - developed specifically for medium to high-powered sports cars, the P Zero Rosso range offers a stable balance between safety and performance without compromise. Drivers can expect incredible handling and excellent cornering capabilities partnered with superb safety in wet conditions and extremely fast water expulsion during aquaplaning. Pirelli Scorpion Verde All Season - the ideal choice for SUV’s, Crossovers and light trucks, the Scorpion Verde All Season guarantees savings, respect towards the environment, comfort and safety on all road surfaces. It’s great lateral stability and wet and snow traction assures all season performance. For over a century, the history of Pirelli has been intertwined with history of the car. Pirelli Tyres produce a wide range of specialist, premium products aimed at medium to high-powered vehicle types and has built strong working-relationships with the world's leading car and motorcycle manufacturers. Using their innovative compounds, large development team and tyre technology the Pirelli name is synonymous with quality, performance and durability. 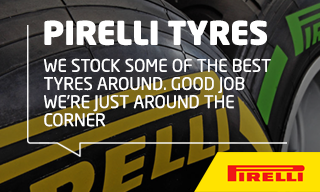 ATS Euromaster are proud to carry Pirelli Car, 4x4, Winter and Summer ranges in our service centres throughout the UK. For further information on Pirelli Tyres, you can use our ‘Find Your Tyres’ selector or visit your local ATS Euromaster centre where our tyre experts will help select the right product for your vehicle and ensure they're fitted correctly.